Australian natives The McClymonts have released their second US single “I Could Be A Cowboy,” which was produced by Nathan Chapman. 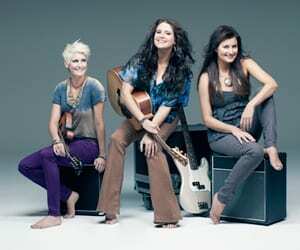 Co-written by the three McClymont sisters (Brooke, Samantha and Mollie) and Chapman, “I Could Be a Cowbody” was released in January, during Nasvhille’s CRS Radio Convention. The country trio also performed the number at MusicRow’s 10th Annual CRS Meet & Greet. The sisters have been met with great success in Australia. Their first four singles topped the Country Music Charts in Australia and their first two albums achieved Australian Recording Industry (ARIA) Gold certifications. In June 2011, The McClymonts relocated to Nashville, TN, and released Wrapped Up Good on BSM Music (distributed by Fontana Distribution). Wrapped Up Good was produced by Nathan Chapman and Adam Anders (Fox TV’s Glee, Shania Twain, Hannah Montana). The album’s title track peaked at No. 28 on MusicRow’s CountryBreakout Chart. They are scheduled to release their third album, Two Worlds Collide, in the states later this year.